Billy (Snail) – From SpongePedia, the biggest SpongeBob-wiki in the world! 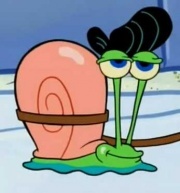 Billy is a snail who just appears in the episode Gary in Love (knock off of Krusty Love and Valentines Day). His owner is called Brad. After Billy came back from going for a walk with Brad, he becomes Mary's new boyfriend, which makes Gary and Mary's Ex-Boyfriend very sad. Billy has a pink coloured shell like Gary. On his shell there are no dots, just red lines like Gary, just thiner. His has a green-blue skin, black hair and blue eyes.